Professor Charles Jackson and William Morton jointly attempted to patent "Letheon" for private profit; but it was Morton who endured most of the obloquy for doing so. Several days after Morton's triumph at Massachusetts General, Professor Jackson staked his claim to the invention. Jackson demanded that Morton pay him a fee of $500 against 10% of future revenues. Outraged, Morton and his patent attorney nonetheless cobbled together a deal with Jackson. Jackson joined Morton’s patent application, with Morton scheduled to receive 65% of the revenues, the attorney 25% and Jackson 10%. The agreement didn't last. 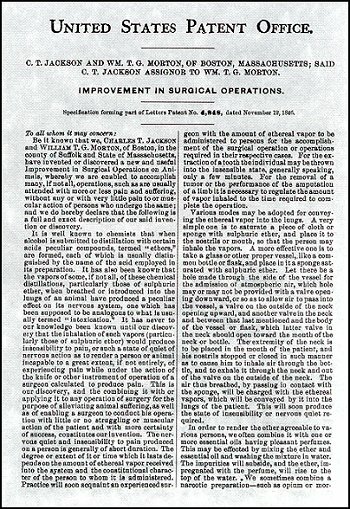 In 1861, Jackson published A Manual of Etherization. By this stage, he was claiming not merely that he had instructed Morton on the anaesthetic properties of ether, but that he had employed the "nominal medical pupil of mine” [i.e. Morton] to stage the famous demonstration at Massachusetts General Hospital on his illustrious Professor's behalf.